End-of-life textiles, what are they? The terminology of textile recycling may appear complicated to the consumer. What, for example, is the difference between reusing and recycling? Senior coordinator Hanna Salmenperä from the Finnish environmental institute SYKE answered some questions on the topic. Her work mainly consists of research on waste, recycling, and waste prevention. Ms. Salmenperä has recently made a report on juridical and administrational interpretations and procedures concerning end-of-life textiles and says she was rather surprised about how challenging the work was, as there are no easy answers in the topic. The terminology around end-of-life textiles is still constantly under development and even entirely new interpretations will be required. New questions are likely to come up that the current instructions may not be able to answer. Salmenperä defines end-of-life textiles as something unnecessary for its owner, including both reusable textiles and cast-off waste textiles. During the Telaketju project it has been determined that reusing textiles or clothes means using them in either their original intended use or as parts for new products. According to this definition using clothes or fabric to manufacture new products, for example making tote bags of old curtains, is considered material reuse. When being reused as such, the product or material has no waste status, but there is no unambiguous answer to what kind of textiles are still suitable for reuse. 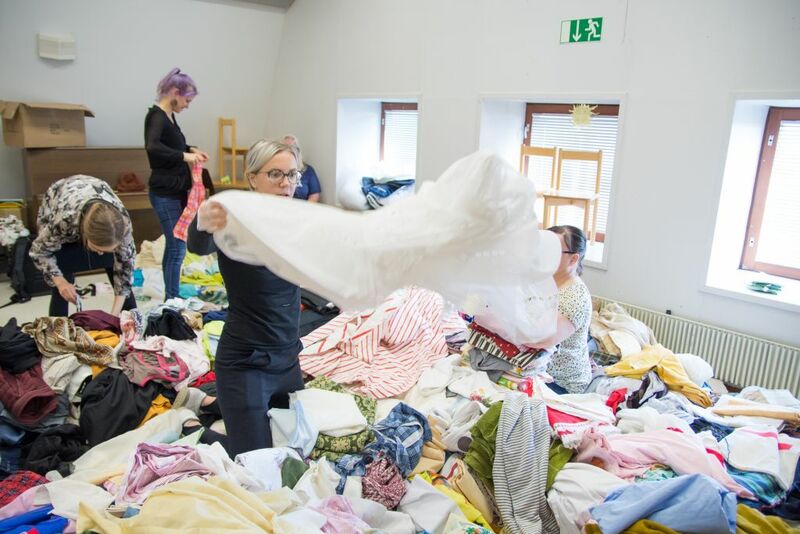 The best-known actors in collecting textiles for reuse are different charity organizations that have already established good collection networks. In addition to them there also are some private actors who usually collect a specific material fraction for reuse. More significant than finding solutions to recycling textiles, however, is to advance their reuse, as according to research most of end-of-life textiles are in reusable shape. Recycling the material on the other hand means mechanically or chemically treating it before using it to manufacture a new product. Mechanical recycling is still quite sparsely in use in Finland and there are several research projects regarding chemical recycling, aimed for commercial use. Now the majority of our tattered textiles ends up in mixed waste, from where they end up in energy recovery. According to a research made by SYKE 58 000 tonnes of textiles ended up in waste management in Finland in 2012, equalling 10,8 kg per person; at the same time Finland exported 8 million kilograms of textiles intended for reuse. The questions regarding definitions and waste status are more important than they may seem at first, as they are closely linked to how legislation is applied and what kind of procedures are required. Collecting textile waste is not yet obliged in legislation, but the waste directive is being renewed to include obligatory collection for textiles separately in 2025. According to Hanna Salmenperä it is not yet clear, though, if one collection station per municipality will be enough or will establishing a wide collection network be required. Salmenperä advises consumers eager to recycle their textiles but not having the facilities for doing so, to be patient and follow the public conversation, as a change is on its way. She is confident that the consumers are ready to sort and separate their end-of-life textiles as soon as the technical solutions to recycling them become available. More significant than finding solutions to recycling textiles, however, is to advance their reuse, as according to research most of end-of-life textiles are in reusable shape. The most important thing to do as a consumer is to acquire durable clothes, have them repaired instead of disposing of them and consume within reason. Reusable textiles can also be given to one’s neighbours or friends, so reuse does not always require an organized collection service. End-of-life textile means both reusable textiles and textile waste, ie. cast-off textiles. Reuse means using the product or a part of it in its original intended use. Also using textile products such as fabrics as a material for new products is defined as reuse. Textile recycling is mechanical, chemical or thermal treatment to use the material as a raw material for new products. Reusable textile is whole, clean and usable. Mechanical recycling means breaking the fabric into fibre and using the fibre for manufacturing recycled fibre products such as filling material and soakage products or thread to use in making new textile products. Chemical recycling means recycling the raw material of the fibres into a raw material for new fibres by dissolution or via other chemical processes. Thermal recycling means recycling mainly synthetic fibres back to fibres using melt spinning.